Conversion Rate Optimisation (CRO) is ultimately about influencing more visitors to take a desired action on your website. Understanding the psychology of persuasion and learning what influences human behaviour can help you to better understand your customers and their decision making process. This can then be leveraged and implemented into your digital marketing strategies to further improve conversion rates and increase revenue. Provoking a form of commitment in potential customers as early as possible in the buying process is highly recommended. People desire consistency. They don’t like abrupt changes in their lifestyles and they certainly don’t like changes in their bank accounts. For example, if your brand offers a monthly payment service (think about the likes of Netflix) and a customer signs up only to discover hidden costs arising further down the line – they aren’t going to be happy! Its human nature that whenever we make a commitment, we feel somewhat obligated to finish what we started. With regards to increasing conversions, encouraging a customer to make an actual commitment on your website will compel them to take action. People tend to step back from a complex problem and search for a simple solution. This notion takes root in our basic survival instincts. Complex things often result in unpleasant or even dangerous surprises which is why we look favourably on clear and simple alternatives. 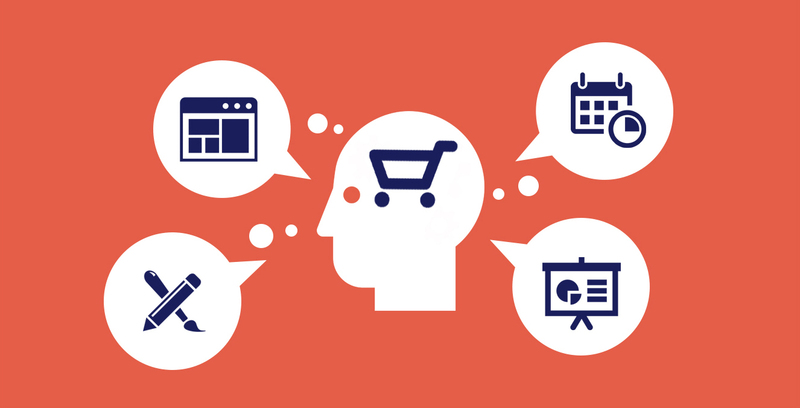 How can you take advantage of this basic human instinct to increase eCommerce revenue? Use orderly web pages that are easy to comprehend. The way that a customer interacts with your website should be fairly straightforward. Avoid any unnecessary obstacles and present product listings and purchasing information clearly on your webpage. Make life easier for your customer and you will see a steady improvement of conversions. As with children, adults also enjoy doing things that they have seen others do. This is referred to in the online market as “social proof”. There is something comforting in the knowledge that you are not the first person in the history of time to use a service or to purchase a product which is why, when a customer sees testimonials and reviews, they are more likely to make a decision regarding your service or product. We find security in numbers, a principle known as “Wisdom of the Crowd” and because the majority of people seek out some kind of community, whether that be in the form of supporting a football team or reading tons of product reviews before buying something, people need security. E-Commerce is no different which is why it is worth taking advantage of this basic human nature to increase sales by showing potential customers that your brand has been used by many customers in the past. You can achieve this by publishing reviews and testimonials on your website and expanding brand awareness via social media. If people feel rushed to buy something, there is an increased chance that out of fear of missing out, they will make an impulse buy. The same idea can be said for buying things that are seen as rare or difficult to find. This is all explained through ‘Loss Aversion’ which is a cognitive bias and states that a person is more willing to gain something than risk losing it. Adapting this into your internet marketing strategy is fairly simple – create a sense of urgency. You can do this by presenting limited time offers, countdown clocks, limited free delivery offers, 24 hour sales etc. Conversion rates are effected by page loading times. For example, studies have shown that if a web page takes longer than three seconds to fully load, viewers will grow impatient and are likely to leave your site and seek out your competitors instead. To increase conversion rates even further, it is worth thinking about the time that it takes to take a desired action on your website. The time that it takes for you to move your mouse to a specific target area (for example, a BUY NOW button) is the product of two relevant time factors: Size of target + distance to target. This is referred to as Fitt’s Law. Having a larger target to encourage users to take action is recommended because it will take less time and increases CTR. Choose interactive buttons rather than text. People are likely to glimpse at text and shift their eyes elsewhere, whereas having a large attractive button on the screen will help to improve conversions and encourage users to take action.